Modular Disc-Wing (Frisbee) Urban Cruise Munitions, also called Lethal Frisbee UAVs (Unmanned Aerial Vehicles), are under development by Triton Systems at the behest of the US Air Force. It is believed that the 3-D maneuverability of the Frisbee-UAV format will provide "revolutionary tactical access and lethality against hostiles hiding in upper story locations and/or defiladed behind obstacles to direct observation and fire." "The fuzing mode of the MEFP warheads will be controllable so as to provide a single large fragment (bunker-buster) or tailorable pattern of smaller fragments (unprotected infantry or light utility vehicles)." MEFP (Multiple Explosively Formed Penetrator) warheads have been under development since the 1980's. The intent is to provide a technology allowing not just single munition loads, but many individual penetrators to attack light materiel area targets. Initial MEFP warhead concepts utilized a steel case, LX-14 explosive billet and a tantalum, iron or copper liner embossed or formed to produce the individual penetrators. The design spec for the Lethal Frisbee UAVs requires that they may be directed wirelessly by an operator, or run in fully autonomous mode - "autonomous target classification routines." All flight data will be transmitted back to the controllers. If you think that maybe you've heard something about Frisbees and the military before, you're right. 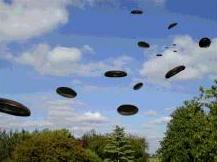 The Navy spent hundreds of thousands of dollars experimenting with six-foot diameter frisbees in the early 1990's. As far as I know, the military has given relatively little thought on how the enemy might stop this weapon. Fortunately, the "outside-the-box" thinkers at Halfbakery.com have been working on this problem for years. In the comments on Giant Frisbee Warfare, one reader suggested that the perfect counter-weapon would be a "really big dog." It turns out that DARPA is working hard on the BigDog robot (see Bradbury's Mechanical Hound and DARPA's BigDog Robot and No Runts In BigDog Robot Litter). This muscular bot may be just the counter-weapon to Lethal Frisbees that enemy combatants might be looking for - assuming that somebody is getting to work on a suitable set of robotic jaws. U.S. military strategists are advised to take note. Read more about Lethal Frisbee UAV robots here and here.